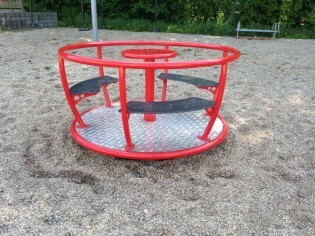 Hot galvanized and powder painted roundabout with diameter 1,4m or 1,65m and three or four seats options. The floor is covered by PE plate. Thanks to this solution the roundabout's floor is soft (more safety) and anti-slip. Moreover it is not heating during sunny days and is not freezing during the winter. Aluminum floor option is also available.